Timeless style. Modern construction. 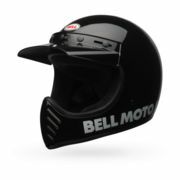 A veritable replica of the original Moto 3, the Bell Moto III Helmet brings the design into the 21st century. The lightweight fiberglass composite shell and modern EPS design provide up to date protection without compromising the retro look. The bold graphics and 5 snap visor stay true to the heritage of the acclaimed Moto series helmets. Whether you ride a scrambler, a standard or a chopper, the classic, dirt-inspired Bell Moto 3 Helmet has been reborn for the next generation of riders. Really tight getting it over your ears, but once it’s on it fits me perfect. I noticed even in the little manual that came with it says to pull the straps outward to make it easier to slip on. Over all I love this helmet. Looks awesome and is really comfortable. Of course it takes some wind noise, but it’s still quieter than my full face scorpion helmet. Pricey but great vintage look! Love the look of the helmet, snug to start expecting it to loosen with time. Can the graphics be removed easily?